Order today and start protecting your walls and add a finishing touch all at once. 100' coils of 4" cove base allow for a clean installation without seams, ideal for large rooms or big projects. Special order, non returnable item and cannot be canceled once placed. Thick and durable making it ideal for high traffic and commercial locations. No minimum order size required. Mannington Edge Vinyl Wall Base comes in 31 colors. These 100' coils are perfect for large jobs in commercial settings. Special order, non returnable item and cannot be canceled once placed. 6" high cove base is a fast and easy way to complete any room. Check out our low flat rate shipping and save big! 100' coils of wall base makes achieving a near seamless installation a snap. Perfect for large remolding or building jobs. Non returnable, special order item and cannot be canceled once placed. This is the thickest and tallest Mannington Vinyl Wall Base available offering unbeatable protection to the base of any wall. Mannington wall base comes in 31 colors. With its 6" height and 1/8 inch thickness it is the most durable type of Mannington Vinyl Wall Base offered. Non returnable, special order item and cannot be canceled once placed. Mannington tile to carpet transition strip in 12' sections. This comes in 12' sections. Joins 1/2" material to lesser gauge material. Tile reducer for 1/8" to 0". Available in 3' sections. Reducer for glued down carpet or cut to fit aginst tile. The Mannington XXX710 Carpet to Resilient Transition comes in a 12' section. The Mannington XXX735 Underslung Reducer Transition comes in 35' sections. Mannington XXX800 Imperial Reducer Transition - 1/4"
The Mannington XXX800 Imperial Reducer Transition - 1/4" undercut comes in 12' sections. The Mannington XXX930 T-Molding Transition connects 1/4" or 5/16" thickness of flooring and comes in 12' sections. The Mannington XXX940 T-Molding Transition is available in 7 popular colors. 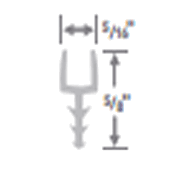 This Mannington t-molding track extender offers 5/8" more height to your floor transitions. Use this plastic extender clip between the vinyl track base and the transition. Sold in 12 ft sections.